Codman Square in Dorchester is named for Rev. John Codman IV (1782 - 1847). His grandfather (John Codman II), a slave master and landowner in Charlestown, was famously poisoned by his slaves in 1755. These are from a vigil and march on November 2, 2016 for Terrence Coleman who was shot and killed by the Boston Police. Terrence Coleman, 31, was shot after EMTs were called to help with a mental health crisis by Terrance's mother, Hope Coleman. These photos are from the August 9, 2016 Mass Action Against Police Brutality march marking the two-year anniversary of the death of Mike Brown in Ferguson, Missouri. 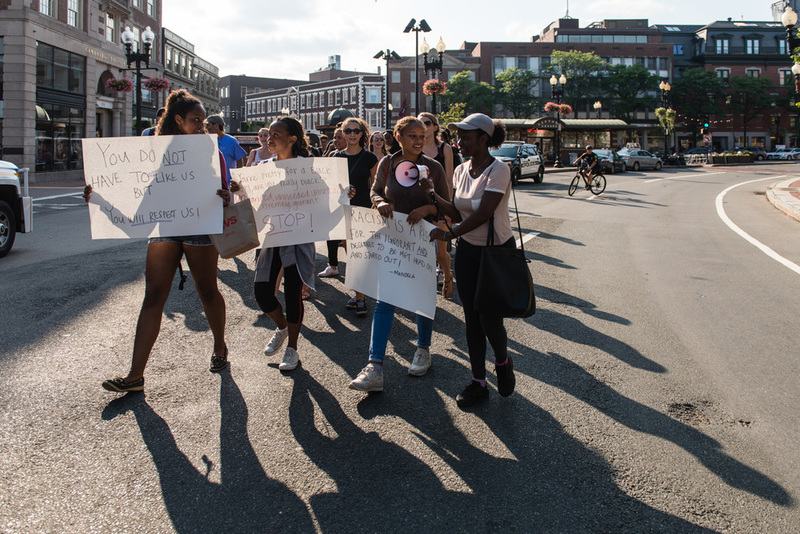 Friday, July 29 as a part of a recurring, three day protest about fifty people marched from Harvard Square through Central Square to Kendall Square in Cambridge. These photos are from the July, 13 Unity March Against Terror on the one-year anniversary of the death of Sandra Bland.